Universal group of Institutions organised UGI Achievements ceremony. Balbir singh, Triple Gold Olympian and victorious Olympic captain was chief guest at the moment. 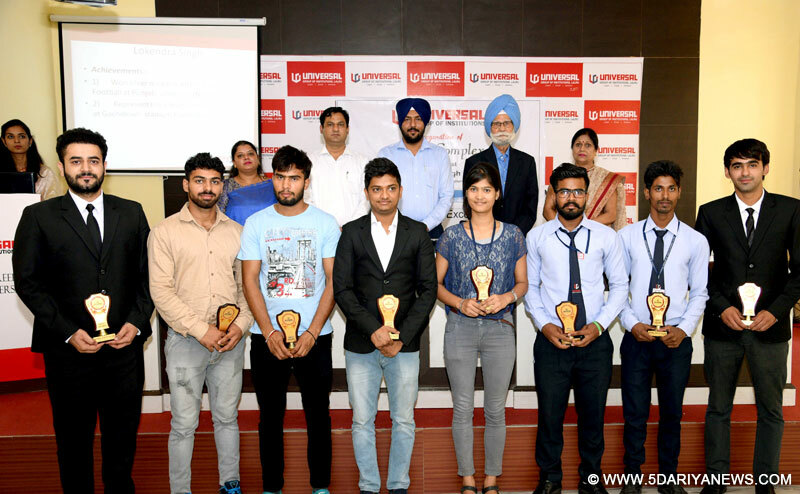 Students were honoured and appreciated for their achievements and contribution in the field of sports by Chief Guest Balbir singh. Balbir singh also shared his deep knowledge with the students. He said that a student should never forget the importance of study along with sports, he further shared his experience in the field of sports and Olympics and other achievements to encourage them to work hard in life. He concluded his words with a mantra to success Think positive, Dream High and work hard.While speaking at the moment Chairman UGI Dr. Gurpreet Singh said that Sports has provided unique opportunity for young students from all over the country to come together & compete with each other to attain higher and higher levels of sporting excellence. Playing the game and playing well is what sport is all about. She further informed that we need to build a sports culture so that students can get opportunities to excel in international events. According to her sports is one such domain where if proper boost is given children showcase immense talent and potential. Campus Recruitment at UGI by S.R Precision with 1.2 Lac package.